Sometimes a project is thrilling from the very start. If it isn't, I don't often find it worth pursuing (since quilts should be fun, right?). 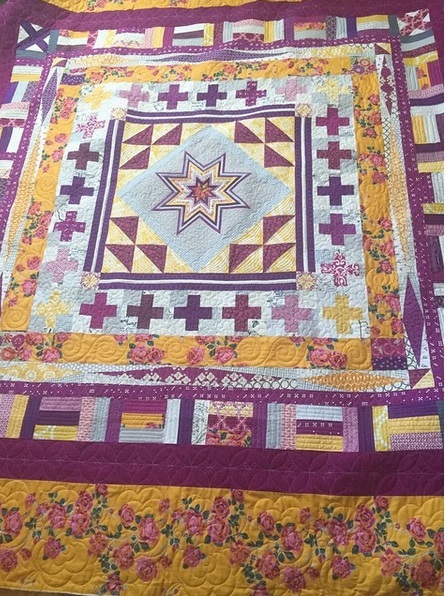 Last year, four quilty friends teamed up to start their own dreamy quilts and pass them along throughout the year, and here is the end result of mine (see bottom of post to view all the quilts together!). This quilt had humble beginnings in March 2014. I chose a palette of jewel colored fabrics and wondered aloud: why are so many quilts white and gray (as much as I like those colors)? 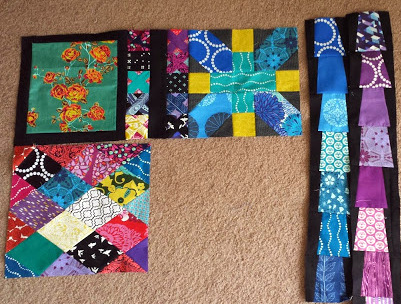 What would a black background quilt look like? I can tell you now that it is quite linty, but nothing a good wash and a few runs of a lint roller can't handle. ;) Black and jewel colors = cave of wonders! It nearly sparkles in person. Besides the black background, the only other request I had was to lay the blocks out in an alternate gridwork and create a true everything-but-the-kitchen-sink quilt. It took me the longest time to decide how to quilt it, which is why it hasn't been finished until now. 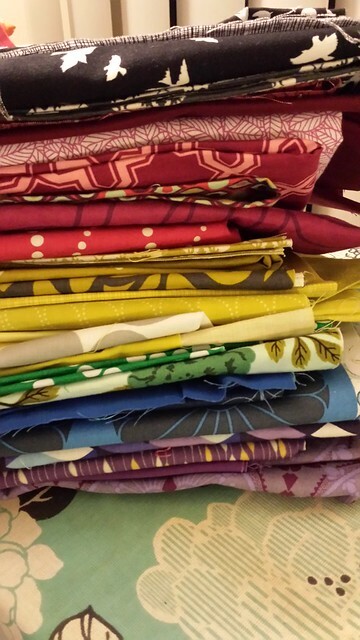 On my recent scope where I talked about choosing quilting motifs, I mentioned that I don't rush decisions like this. 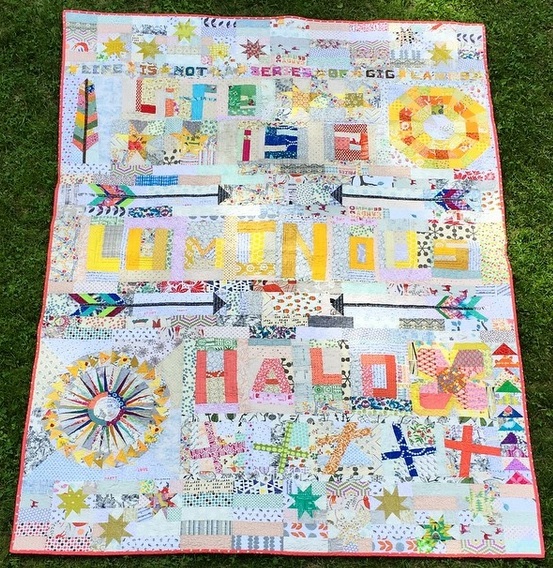 As many of you might guess from my work, I like to "quilt things to life" and I take it very seriously! First, I quilted a series of wavy lines with my free motion foot through the middle of the quilt. I used Better Off Thread's tutorial for Ultra-Wavy Quilting and tweaked it to my liking. Funnily enough, I intended to continue this motif throughout the whole quilt, but it became tedious pretty fast. There's another reason to start quilting in the middle of the quilt: to make sure you like it! To break up the quilting monotony, I used a similar quilting style to create large, close together swirls amongst waves on the top and bottom of the quilt. I think it gives the quilt a lift and even more movement. I'm absolutely thrilled with the outcome and feel encouraged to trust myself with out of the box decisions in the future. When I go out of the box, I do my best work. Renee included these Echino bird blocks, amongst others. Ah! So perfect! Even back in March 2014, I knew what I wanted for the backing! My lovely friend Sandi sent me some Britten Nummer from IKEA (since I don't have one close by). And before you go and look for it at your own store, please know that they don't print it any longer. :( You might be able to find some in the clearance section, but lots of quilters on Instagram have scoured their local IKEAs for this lovely, modern text fabric! I combined the white fabric with jewel-toned scraps from my Anna Maria Horner scrap basket (yes, I have a special basket, don't judge). This swap didn't come without stress. I wanted to do my best work, so it always took lots of time to complete each person's section. It really was a pleasure to work so hard on something and see the quilts morph over time, though. Also, we originally started out with five members, but one flaked on us completely and even still has two partially complete quilt tops and fabric that isn't hers. Something positive did come out of that experience after all; it inspired Renee and I to collaborate on a blog post, Top 10 (but really 18) Tips: Being a Good Swap Partner/Beemate. 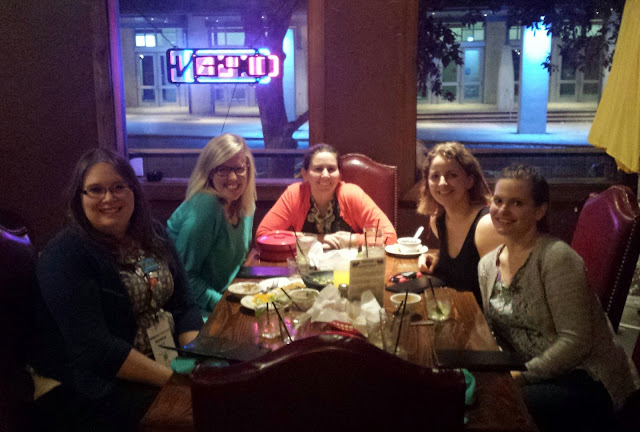 From left: Me, Ashley, Michelle (from this year's swap), Renee, and Laura met for dinner at QuiltCon - the first time we all met each other! Ah it is so awesome seeing them all finished and together! 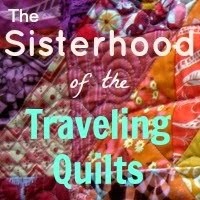 I definitely felt that this quilts created a sisterhood among us and among the quilts! I totally agree that that pattern gets tedious! I did it on a twin sized last year and was UGH so bored! So I like the changes you made, it adds nice focal points to the quilting. I giggled when you said #2605 is dark grey (official name is just Grey). I think most quilters agree with you, but honestly it is a medium grey, otherwise it wouldn't show up on black so much. I have a cone of 5004 and consider it a medium grey too, haha. I'm on the hunt for a solid dark grey. The quilting looks wonderful, Jess. I love the "quilt the life into it" motto, and I think the progression from the natural lines to swirls is just right. The purple binding really pulls it together. And thanks for sharing all the quilts together. Stunning work, I am also totally agree that that example gets dreary! I did it on a twin estimated a year ago. I think most quilters concur with you, however genuinely it is a medium dim, else it wouldn't appear on dark to such an extent. Essay writing service reviews has an indispensable part to play in exploration and distributed and a key stride in that procedure is the amendment of your essay.However, knowing how to react to analysts' remarks isn't generally simple - take care of business and you could see your essay distributed, fail to understand the situation and it could mean dismissal.